Harold Pinter can be as inscrutable as anybody this side of Samuel Beckett. That&#146;s one of the reasons that his 1978 Betrayal came as such a relief. Totally accessible, the story of a woman, her husband and her lover is sometimes known as &#147;the backwards play.&#148; That&#146;s because Pinter begins at the end of Emma&#146;s marriage to Robert and zigzags back through time to the beginning of her seven-year affair with his best friend. And then brings down the curtain. It&#146;s a delicious device, maximizing both the humor and the tension in the script. Aurora Theatre Company has a way with Pinter, as demonstrated several seasons back by its astonishing production of The Homecoming. 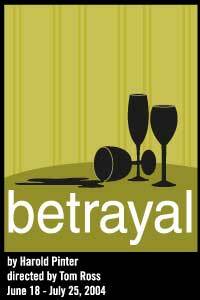 Betrayal, deftly directed by Aurora&#146;s producing director Tom Ross, continues the legacy, albeit in a lesser manner. If this production has a serious flaw it is in the casting. Charles Shaw Robinson, elsewhere a very competent actor, is all wrong for Robert, the husband. His speech merely hints at the requisite British accent and he seems strangely withdrawn, not only from the audience and his spouse, but from the events of his own life. He does exude a certain menace in the pivotal scene, set in a Venice hotel room, that uncovers the truth about the affair, but, aside from that, he simply is not engaged. Christopher Marshall fares much better as Jerry, &#147;the other man.&#148; He may strike some as the wrong physical type but his accent is right and his emotion pretty much out there. The linchpin &#150; not only of this production but of the play itself &#150; is Emma, wondrously portrayed by Carrie Paff, in her Aurora debut. Torn between her family and her desire, Emma goes from vulnerable to disillusioned and back again. Or, in Pinter&#146;s reverse chronology, forward. Paff has her down to perfection, from the accent to her cool good looks, subtly adjusted as the time frame changes. Her body language tells volumes as she struggles to get a key off her key ring or turns the pages of a book. In Pinter, speech is spare and the subtext is all. There are many levels of betrayal going on here, some more apparent than others. Not only does Emma betray her husband with Jerry but she betrays her lover by confessing the affair to his best friend. Except Robert has known about it for years, betraying Jerry by going on as if nothing was wrong. When Emma announces that she has become pregnant by her husband, her lover feels betrayed. Yet, there is a strong hint that her oldest child, a daughter, may be his. And so it goes, like those Russian dolls that open to reveal yet another one inside. Pinter alternates the tense, serious scenes with those that are lighter and the Aurora cast is adept at playing for laughs. But, there is genuine heartbreak underneath and the final image, as Emma struggles with her conflicting passions at the very beginning of the affair, is unforgettable.